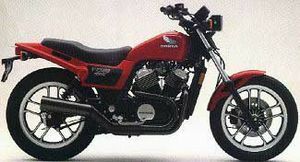 The Honda VT500 was more commonly known as the Honda Ascot. The Honda Ascot VT500 was produced only two years, 1983-1984, as a "standard" motorcycle. The CX500 was another choice as a 'half-liter' bike, however, '83 was it's last year in Honda showrooms. The VT500 is a transversely mounted V-twin, 500 cc's, on a sport frame. It's physical characteristics are shared with it's cruiser counterpart, the Shadow 500. Essentially, the two bikes are alike except for only a handful of differences. The frames are alike but on the Shadow, the foot pegs are mounted forward and the seating position is lowered. The Ascot has a straighter handlebar than the Shadow, along with a larger diameter rear wheel for cornering stability. The engines appear to be identical except for the Ascot having a shorter gearing, designed more for the performance end of riding. The Shadow has dual mufflers while the Ascot ports all of its exhaust out one muffler. The styling cues differ greatly but complement each bike individually. Cruisers look good with chrome. The Shadow has lots, all the way from the mirrors to the mufflers. The Ascot emphasizes it's aluminum parts more by painting much of what's chrome on the Shadow, black. The Ascot shares many of it's design cues with the Nighthawk counterpart, the 700S. You could actually say it the other way around since the 'S' didn't come out until a year after the introduction of the '83 Ascot VT500. The VT500FT'83 Ascot was sold in 1983 in one of two colors: Pearl Siren Blue or Candy Bourgogne Red. The side cover panel on the blue bike was silver, but on the red bike it was black. The gas tank wing decal was 2-tone. The 2-into-1 exhaust system was black chrome. The VT500FT'84 Ascot was sold in 1984 in one of two colors: Black or Candy Bourgogne Red. The side cover panel on the black bike was silver, but on the red bike it was black. The gas tank wing decal was 3-tone. The 2-into-1 exhaust system was black chrome. The engine was a 491cc OHC 3-valve liquid cooled V-twin linked to a 6-speed transmission and a shaft drive. The serial number began JH2PC070*EM100001. This page was last edited on 8 September 2010, at 12:18.